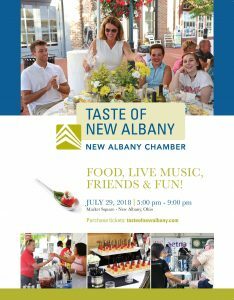 Taste of New Albany: An evening of fun, food, friends & live music by Hi Fidelity. Location: Market Square, New Albany, Ohio Date/Time: Sunday, July 29, 2018 Time: 5:00pm - 9:00pm Dress: Summer cocktail garden chic or Summer festive sassy casual chic. Parking: Behind either side of Market Square storefronts, the New Albany Library or Heit Center. Best Decorated Table Contest: 1st, 2nd, & 3rd place prizes are awarded for the best decorated tables. Participation is optional. The tables are nicely decorated as is, so have fun with this or simply enjoy the event. Sunday, July 29, 2018 5:00pm - 9:00pm Event occurs rain or shine; tickets are non-refundable. No tickets sold day of event. $65/Individual Reserved Seat $25/5 drink ticket pre-event discountBeer, wine & cocktails available to purchase at the event with a credit card or cash. You must be 21 years of age to purchase or drink alcohol.